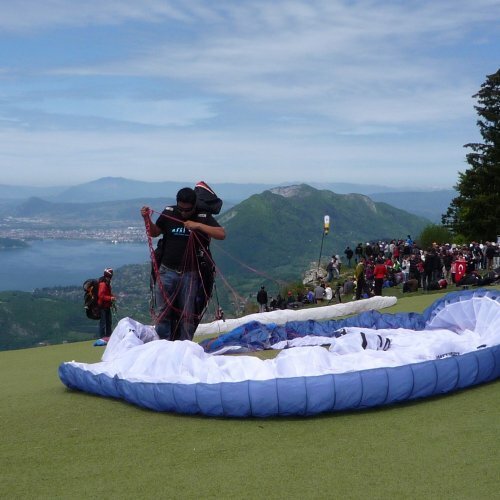 Talloires and Montmin : the paragliding mecca ! 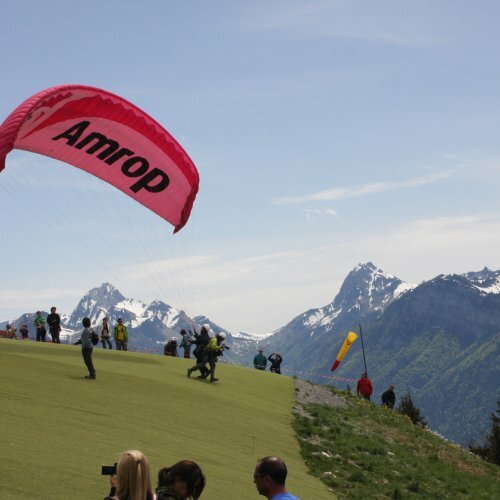 Thanks to its location, its ease of access, the number of flights possible, the aerology and the panoramic views, Talloires has become the premier paragliding spot in Europe. 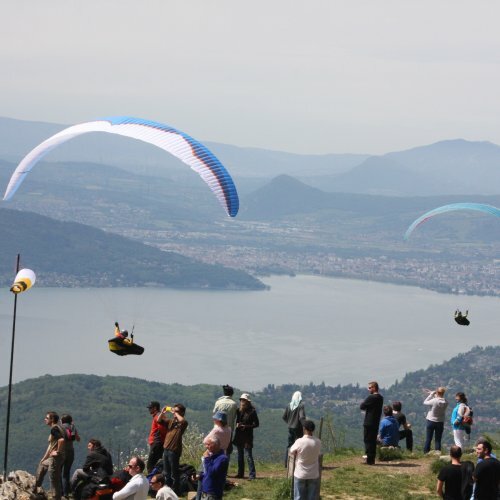 From the sky to the lake, we can admire the colourful splashes created by the paragliders. Access : from Talloires, heading towards Col de la Forclaz, at the village of Verel take a left and follow the signs for "Forêt Aventure". Flying conditions : easy take-odd except in crosswinds. Area covered in a plastic mat. Thermal flight, cross-country departure. Dangers and difficulties : site can be very busy. 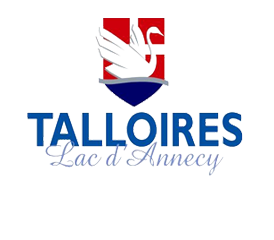 For more information about obtaining an access card, please contact the Talloires Town Hall. 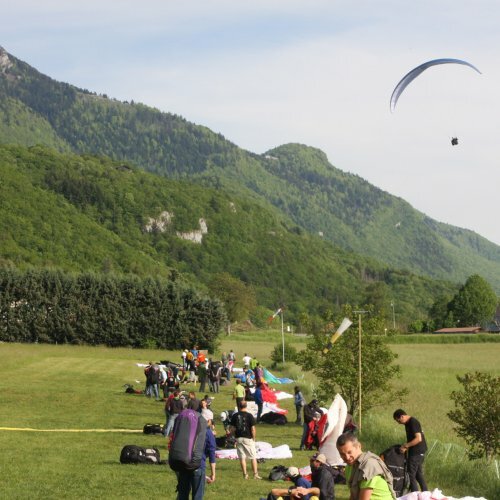 Access on foot is possible for pilots and spectators. 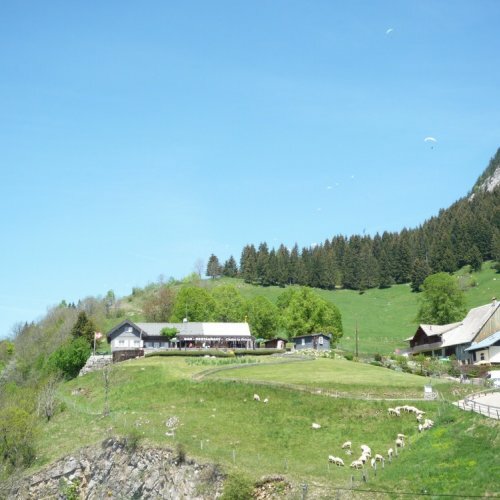 Accessible by a path from the col de la Forclaz, quieter than Montmin. 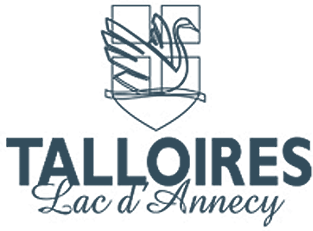 This site can be used in South-easterly - Westerly winds. 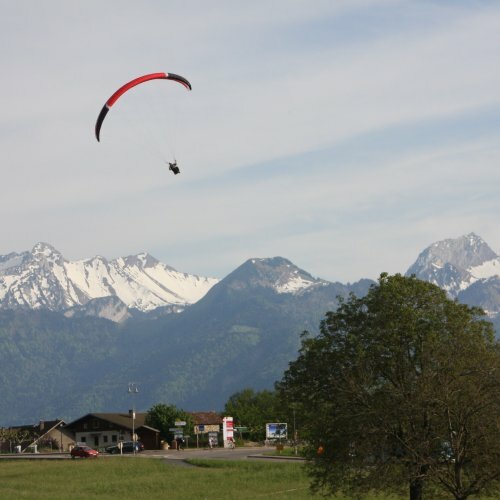 It offers the opportunity to fly over the Aravis mountain range to Lake Annecy. Recommendations : flying over the houses to the south of the landing strip is forbidden. Don't cross the field to get to the car parks or restaurants. Don't park in spaces reserved for firemen or local residents. 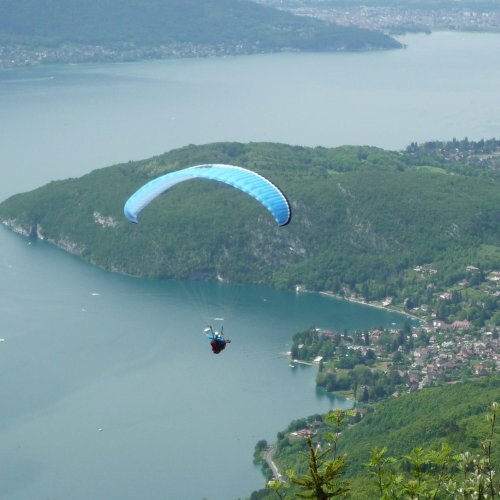 Access : from Annecy, go towards Talloires, along the D 909, next to the Perroix housing area. Observations : Perroix has three schools / shops, campsites, hotels, holiday cottages, bars and fast food, and a sail repair centre. 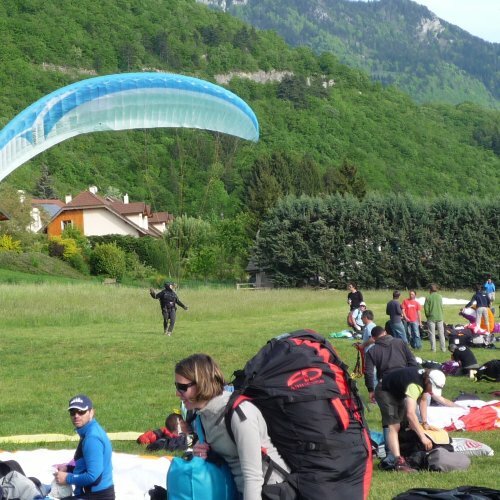 Don't inflate your paraglider in the landing area. Kites must be stored behind the community centre. Observations : Large car park, small bar and fast food restaurant in high season. 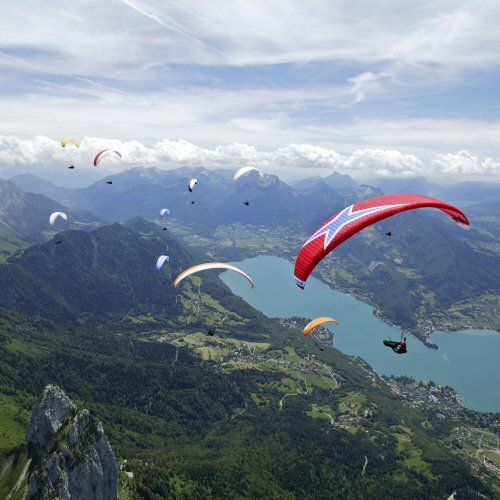 Paragliding shop. Recommendations : powerlines nearby, strong breezes in the middle of the day. Respect the zones reserved for parking and do not cross the field to get to them. 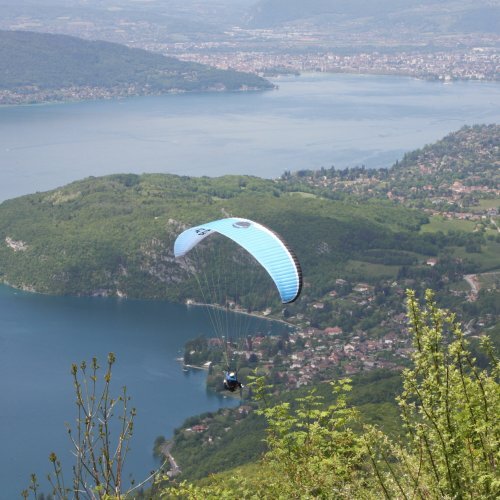 Access : 4 km from Faverges in the direction of Ugine. Parking at the junction of the Faverges/Ugine road and the Marlens reservoir. Observations : the "Espace Marlens" area has a holiday cottage, a school and a shop. 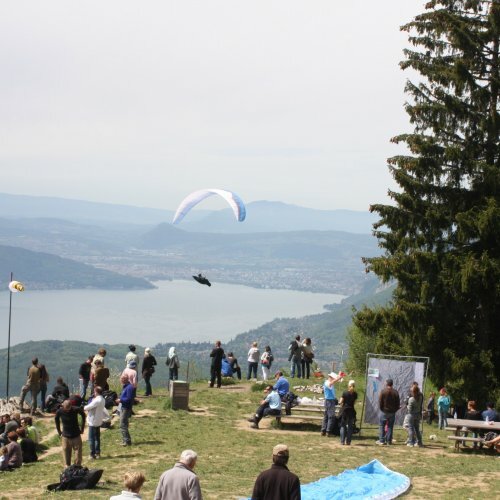 The Lake Annecy paragliding sites are managed by SIVUHL (Syndicat intercommunal à vocation unique des Hauts du Lac). 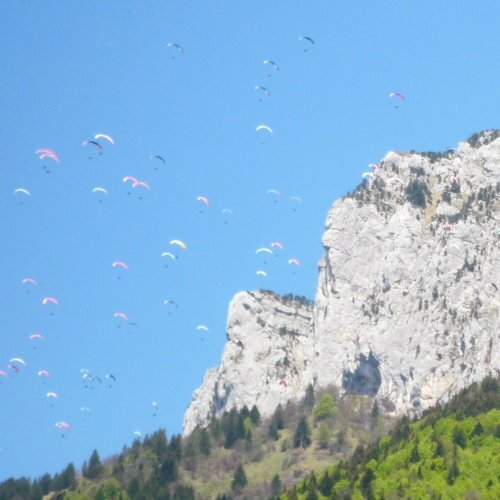 To organise SIV (Simulated Incidence in Flight) training, please contact local paragliding schools.